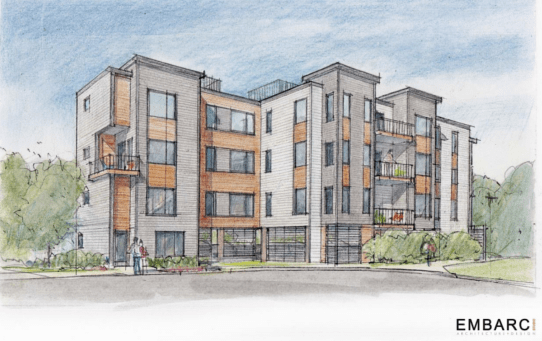 We blogged about the proposal for 19 new residential units on Taft Hill Park (directly adjacent to the city’s public parking lot) a couple of months ago, shortly before the BRA’s public meeting on the developer’s small project review application. And we followed that up with a letter during the comment period. Just this week, small project review concluded with the BRA Board’s approval at their meeting on Thursday, along with five other projects indicative of the current pace of development in Boston. In WalkUP Roslindale’s view, this is the right result. In our comment letter, we expressed overall support for the location and the thoughtful way the developer was taking advantage of the highly transit-accessible and walkable location, while offering our suggestions on certain aspects of the developer’s proposal. The next step for the proposal will be to proceed with the process for obtaining the zoning relief (specifically, variances) needed under the zoning code. This will likely mean another community meeting and then the required hearing before the Board of Appeal. We will continue to follow the proposal and how our suggestions are ultimately responded to. Look for updates here as this proposal continues to work its way through the review and approval process. It’s exciting to see more development come to Roslindale – more density means more people means a more vibrant community particularly for the Rozzie Village businesses. However, before the developers walk away with their nice profit they need to make a substantial contribution to the community such as funding studies of ways to improve pedestrian and bicycle safety and access.